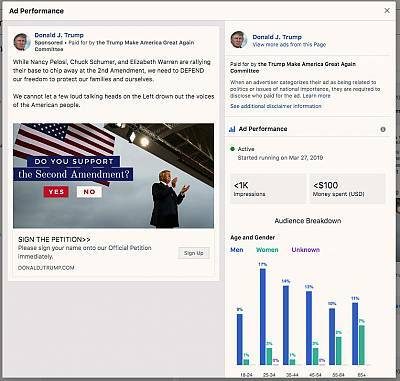 After making Facebook advertisements a key part of its 2016 run, President Donald Trump's campaign continues to spend heavily on the social network as Democratic presidential candidates begin their own social media efforts. Trump spent $3.6 million on Facebook ads from Dec. 30 to March 23, according to data compiled by researchers at the Online Advertising Transparency Project, an ongoing study launched last year at New York University that tracks political ad spending through Facebook's publicly available political ad archive. Trump's spending in early 2019 was more than the Democratic campaigns combined, but he has been outspent by some candidates in recent weeks. Former Texas congressman Beto O'Rourke outspent Trump two weeks ago, dropping $157,000 on Facebook compared to Trump's $109,000. Last week, Sen. Amy Klobuchar, D-Minn., spent $198,000 to the president's $150,000. Trump's ads have primarily focused on his political opponents and his efforts to build a wall along the southern border. Among Trump's biggest targets in the Democratic Party have been Senate Minority Leader Chuck Schumer, D-N.Y., and House Speaker Nancy Pelosi, D-Calif. Trump's ads have mentioned those two lawmakers in at least 16,300 targeted Facebook ads since January, almost 40 percent of the total, according to an NBC News analysis of the data. The wall was the main subject of more than 30 percent of the president's ads during this time period, while appeals for more general support made up 24 percent of his ads. The State of the Union address (15 percent), contests for meals with the president (14 percent) and attacks on the "mainstream media" (7 percent) followed as the most popular talking points for Trump ads. In hundreds of ads — featuring captions like "How much more American blood must we shed before Congress does its job?" 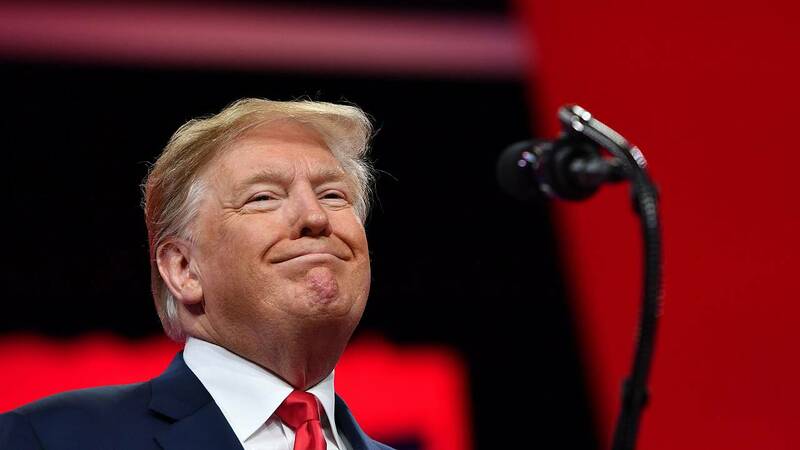 — Trump urged supporters to contribute to an "Official Secure The Border Fund," donations which went to the president's reelection effort. Trump bucked tradition by announcing his 2020 candidacy on the day of his 2017 inauguration. Since then, he's raised more than $100 million, a historic rate for a presidential campaign. Trump spent heavily on Facebook in the run-up to the 2016 election, buying more than 5.9 million ads, Trump's 2020 re-election campaign manager Brad Parscale told PBS. Trump's Facebook ad buys come from two groups: Donald J. Trump for President, Inc., the official campaign committee, and the Trump Make America Great Again Committee, a joint fundraising committee composed of the Trump campaign and the Republican National Committee. Those groups spent about $1.3 million in the first two full weeks in January, with spending declining in recent weeks, the data showed. Between Jan. 6 and mid-March, Trump's campaign made more than 42,000 distinct ad buys. Most of those were the same ads with different target audiences, according to Laura Edelson, a doctoral candidate and member of NYU's Online Advertising Transparency Project. Trump's Facebook ads are also responsive to the news cycle. On Tuesday, the Trump Make America Great Again Committee launched 14 versions of a new Facebook ad that referred to the end of special counsel Robert Mueller's investigation. "After more than 2 years of an endless Witch Hunt, there is still NO EVIDENCE OF COLLUSION," one ad reads. "The Democrats raised millions off a lie. Now we FIGHT BACK!" The data also offers some sense of what has resonated with Trump's audience. An ad promoting an opportunity to have breakfast with the president in Florida was seen more than 5 million times. One of the smallest ad buys featured former New York City Mayor Michael Bloomberg, philanthropist George Soros and Amazon CEO Jeff Bezos, labeling them "liberal mega donors." That campaign included 40 ads and ran for just a few minutes in February. Three-quarters of Trump's ads included solicitations for contact information, while the rest asked for donations. Most ads appear to be targeted at wide regions, according to the data. Edelson said this suggests the Trump campaign is targeting users based on existing lists of personally identifiable data. Much of Trump's current spending is "aimed at expanding and engaging databases of potential supporters and donors," said Greg Dale, the director of campaign relations for Tech for Campaigns, a Silicon Valley volunteer organization dedicated to providing support to Democratic campaigns. In addition to Klobuchar and O'Rourke, Sen. Elizabeth Warren, D-Mass., has spent $526,000 on Facebook ads, the most of any Democratic presidential candidate in the time period. She was followed by Sen. Bernie Sanders, I-Vt., and Sen. Kamala Harris, D-Calif., who spent $521,000 and $420,000, respectively. "Without a hyper-competitive primary, the president can invest long term, while Democrats need to immediately show momentum and build up a base," Dale said.